I hope you're enjoying the dog days of a scorching August summer. Our 15 year old boys are working their first jobs as life guards this summer and it's been a challenge to juggle four work schedules. It forces me to guard our time off together like a hawk and make sure we do more than see each other coming and going. But we've made it work for us and I'm so proud of the boys hard work. They're saving for a car so we have that ahead of us. As for me, I've had the opportunity to collaborate with some new clients whose work I've admired on Instagram. Kristy Keele, a Houston based decorator and owner of West 23rd St. Design contacted me recently to photograph her house. Kristy is so good at mixing colors and pattern and keeps her traditional style sassy and fresh with vintage art and interesting objets. I seriously feel like I need a glass table in my life. The details; layered, thoughtfully chosen, a mix of high and low price points. Kristy has a sharp eye for treasures and makes frequent stops in some of Houston's best thrift stores for herself and clients. Kristy's home office is inspiring as well. Fabric, design books, props, mood boards, art. All the things we decorators love to have at our fingertips. One of the perks of this job is seeing up close and personal how people live. What a lovely thing...to put so much of yourself into your home. I have such admiration for all the little details in Kristy's home. Such eye candy! I don't think she'd mind if I told you about her headboard. It was one of my favorite things in her home. It's a kantha quilt simply folded and laid over an upholstered headboard. Genius! and so pretty. If you're looking for something special for your home, Kristy also sells on One Kings Lane and Chairish. Follow her here on Instagram. My friend and client, Holly Kuhn, of Old Glory Antiques is one talented lady. I recently visited her in Denver, Co., (which is her home base) to photograph the store at their new location which officially opens July 16th. I'm so excited to share a sneak peek with you! Isn't it delicious? Holly has a keen eye for editing and the shop is such a pleasure to wander through. There's inspiration in every vignette. Along with beautiful well worn pieces, there's the occasional new piece that looks right at home. Holly blogs from her website which you can read here and posts regularly on Facebook and Instagram about new arrivals and events. You might recognize Holly's signature style. I've written about Old Glory Antiques in Burton, which you can read about here and worked with Holly Mathis on her Burton home which was featured in Country Living Magazine. She's on fire and has no intentions of slowing down. If you're like me and not lucky enough to live in the beautiful Denver area, Holly is also busy loading items to a new online shop, so be sure to pop in there. Congratulations on the new store Holly!! The November 2014 Issue of Country Living is rolling out now and I'm so happy to share the exciting news that a feature that I styled for them recently is included in the issue. 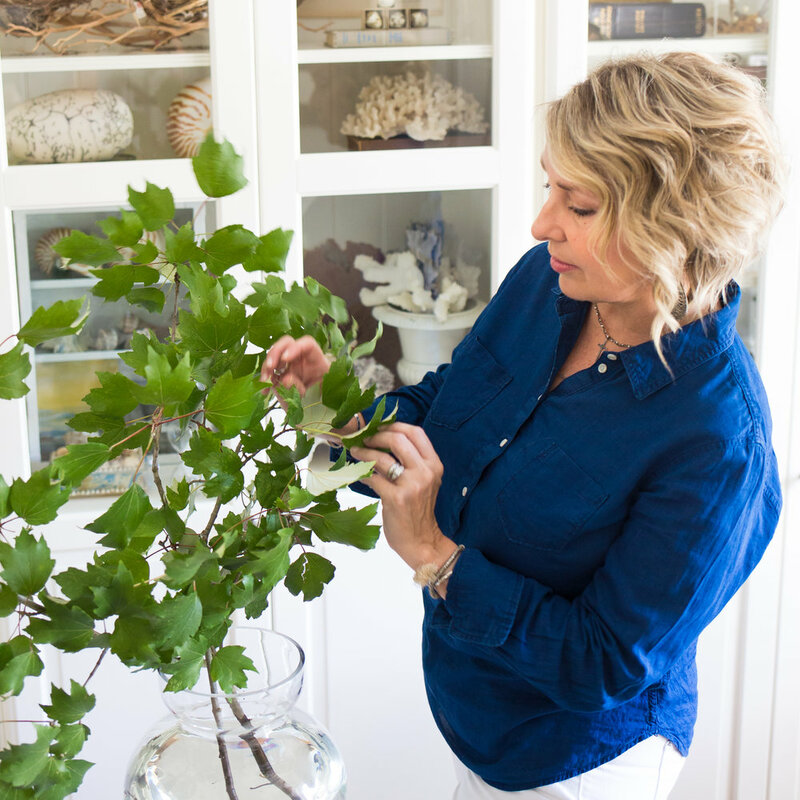 The story features the Texas home of Holly Kuhn, owner of Old Glory Antiques in Burton, Texas, and the design work of my dear friend, the wildly talented Holly Mathis. Holly and I worked on this project together over the summer and I'm thrilled to be able to share it with you through . I hope you'll enjoy it! One of my late summer jobs was a trip to Shreveport, Louisiana, to style and photograph a design project for Jenny Johnston. This home is being lovingly updated by the second generation to inhabit it and many of the antiques and paintings are family pieces. It's Steel Magnolias Southern tradition combined with contemporary colors was so refreshing. I love beautifully framed and displayed photographs. I'm such a fan of gallery walls I have three, with one more in the works, in my home (is that allowed)? But what do we do with all those beautiful little images that are tucked away in keepsake boxes and drawers, or even worse, parked on our iPhones never to see the light of day? Beyond the gallery wall and photo book, I love living with my pictures as little art shows or installations throughout my home. Because they are rotated often, I see these little styling moments as temporary, which frees up my creativity and that simply makes it more fun for me. Grab a handful of your long lost favorite pictures and add some of these ideas to your arsenal of styling options. Folded book art becomes a rolodex of old family photos. Heirloom photos are protected under glass cloches and grouped together with a glass lab beaker. Glass curio boxes are an artful way of displaying images in a mixed media style. These Hipstamatic prints, made with my iPhone, are layered on top of a blank vintage book page. Add a special artifact or two to the display to personalize it even further. One of the easiest ways to view your photographs also invites everyone to enjoy them. A bowl of colorful vacation pics on a coffee table is hard to resist. I hope you'll bring your buried treasures and memories out into your home where you can appreciate them every day in creative ways. Grab your chalk and go. Now that you've seen what LS Slipcovers has done for my home, I want to share some very special one of a kind pieces that were created by the talented team at LS Slipcovers and Bedding. These images are part of a portfolio shoot I did for Laura this past spring. This petite wingback chair is one of a pair. What a sweetie! It's just a bit smaller than a traditional wingback; the perfect ladies chair. The slip cover is made of flax tissue linen with an exposed top ruffled skirt with a 3" puddle and my favorite little detail...pink French knotted edging all stitched by hand. So beautiful and delicate, a gorgeous and unique detail. A blog reader commented recently that Laura's work is that of an artist. I couldn't agree more and am pleased to share more of her art with you. Laura also offers hand-tufted french mattress style floor cushions. These are 18x18x3 but she can also make them to your custom specifications. Perfect for floor lounging or piled around a coffee table. And this little Danish dream of a chair is the Ballerina covered in a gauzy linen slip with a calla lily skirt. Hand French knotted edging and ballet ties on the chair legs. This is the work of designer Laura KM of the LS Slipcovers team of makers. LS Slipcovers and Bedding is located in Houston, Texas. However, you're in luck if you're out of town and would like to upgrade to a more custom slip for select pieces from Ikea, Pottery Barn and Restoration Hardware as Laura is now offering Ready to Wear slips for some of their popular models. Laura also loves to travel so be sure to check with her as she just might be headed to your area. 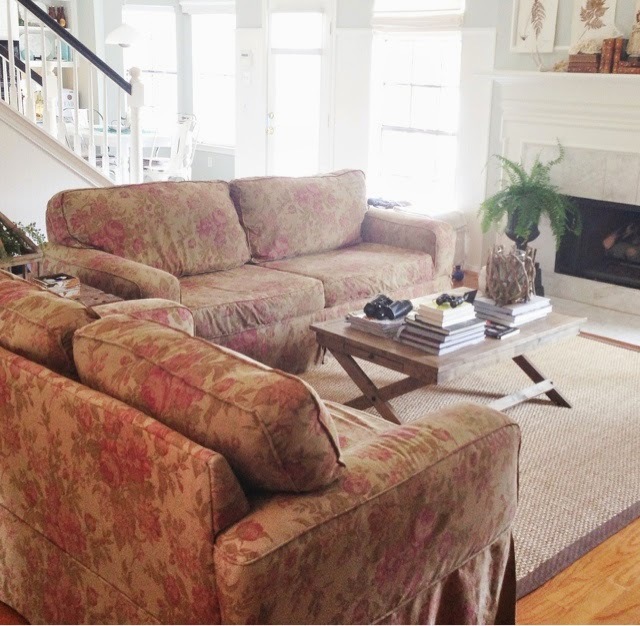 Earlier this summer our new custom slipcovers from LS Slipcover of Houston were installed and lemme tell ya, these two sofas have made me a happy girl. And if I'm happy, then everyone's happy, right momma's? It's exactly what I've envisioned since moving into this house. So light and fresh. But it wasn't always this way. Let me introduce you to what's lurking under those fabulous new white slips. 15 year old sofa's from Storehouse. Built like Mack trucks and just as dirty and road weary. They're my decorators dirty little secret. But when Laura saw them, she knew they could be renewed and were worth saving. And I trusted her, and she was right! The fabric we chose is a white brushed cotton twill that has the feel of an old soft sheet, but has plenty of body so that it's not a rumpled mess. For the style of my slips Laura recommended a waterfall skirt and double top stitch edging which suited the furniture and my own personal fresh cottage style without the fussiness. This fabric was also thick enough to hide the pattern and color of the original upholstery without the need for an under slip. The sofa's back cushions were attached and Laura cut them free and recovered them as separate cushions. I had the seat cushions plumped up by adding a down wrap to the foam cushion insert. They're firm with the perfect amount of "ahhh" when you sit on them. And details, let's not forget it's all in the details. Since the backs of my sofa's are visible we added these beautiful mother of pearl buttons. It's been a while since I photographed this room, so I've pulled together a little room tour to share with you while it's all clean and pretty. If you'd like to read more about how the process of working with Laura went on this project read here. Or, you can visit LS Slipcovers and Bedding for more complete details. I recently styled and photographed some of the beautiful work Laura and her team create and will share that with you soon. Thank you Laura and especially Jeanie for all your hard work. I've spent a couple of days behind the camera this week shooting and styling for a special client. If it's appropriate for the shoot, I sometimes use sentimental items as props. This image is full of them. Aunt Louise's sparkly clutch. Granny Wilson's glasses and my sweet Rachel's pearl bracelet. What a bunch of girly girls they were. This shoot had me wishing for a dressing room all my own. Don't you love being a girl? I love revisiting clients to see the progress they've made on rooms we've worked together on. 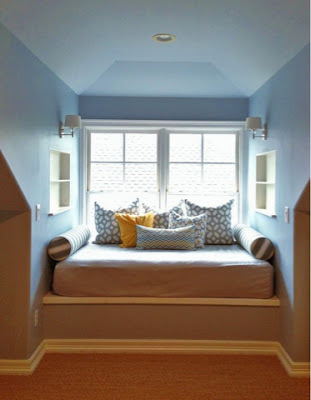 Here's a sneak peek of a full size day bed built into a nook of the third floor studio of my client's home. We're still working on the space but I'm looking forward to sharing more details soon on this room and others from this beautiful home. I just finished a really fun room redesign for a family that wanted to transform a former "formal" living room into a casual multi-purpose room the entire family could enjoy. J wanted a fresh look without clutter or too much stuff. The contractor and I got to work on a design for a wall of built-ins to house a new flat screen tv, lots of storage, shelves and a small computer desk. The walls were painted Revere Pewter by Benjamin Moore and the french doors were painted black which suits J's New Orleans heritage perfectly. Our goal was to keep this room fresh, casual and comfortable. We pretty much started from scratch and worked on this room over the past year as the budget allowed. J was willing to invest in a few important pieces and details, and we also shopped at West Elm, Pottery Barn, Target and HomeGoods. J is mom to teen boys, who bring even more boys home to hang out in this room. Our first order of business was to find some comfortable recliners that fit into the "fresh" category. We found this pair locally and upgraded the fabric. The existing love seat was in great shape and the perfect size so it was updated with new fabric. The wire basket was a find from HomeGoods and was formerly a laundry basket with a cotton liner which we removed. It helps corral the pillows and throws. The coffee table is from West Elm and the pretty metallic bowl from Target/Threshold. Wouldn't it be great if we could *blink* and instantly have a new room. The truth is, renovations and sourcing takes time and lots of patience, even in a small room. J doesn't really like shopping so we did a lot of sourcing online which worked out great. When we did shop together we had a great time and it was painless (for me anyway) because she has a very clear idea of what she likes. She has been a dream to work with and we're all very happy with how the room turned out. All done! Christmas, New Year's, winter break and my birthday have all come and gone and my house and work have returned to something that resembles a routine. I have to say, I was sad to see 2013 go..it was a very good year all in all. Instead of writing out a list of resolutions (which I would never keep..who are we kidding) I made a visual record of reminders. Some literal, others figurative and left to the imagination. Don't we edit as we go anyway? Even as I look forward to big projects, opportunities and collaborations, I'm constantly reminded that it's the quiet details that most inspire me. Sometimes all it takes is one special piece to make a room sing for Christmas. For my dining room, this large scale folk painting is hitting all the right notes this season. I don't know much about the painting, but it appears to be mid century by an artist whose last name is Reynolds. I love the atmosphere and soft colors of the piece. Once the painting was in place, I added cedar on the chandelier, a few branches and flowers, and antique German ornaments in an ironstone bowl. So simple and fresh. Ironstone gets me through every season and occasion so I keep a nice supply on hand. A chalk pen is great for drawing on mirrors as well as chalkboards. on this big wall, but I'm really enjoying how much joy and life this painting brings to the room. I know it's unrealistic and crazy making to think we have to change every surface in our homes for the holidays. We don't! But don't overlook a simple change to get a big effect..then all the little things fall into place easily. A special part of the Christmas season is unpacking our beloved holiday ornaments. If you're looking for a new way to showcase a few of your favorites or a delicate family heirloom, I've got a quick project for you with pieces you may already have on hand. Shapely thrift store candle holders get a fresh coat of white spray paint and are put to work as pedestals for glass domes that highlight those special ornaments. These are especially pretty when grouped together on a tabletop, buffet or mantel. of Shreveport, Louisiana. Jenny is a full service designer who just nails it when it comes to beautiful finishes. Each and every room gorgeous and thoughtfully designed. I recently photographed and styled a kitchen that Jenny remodeled. She's saving the big reveal (maybe a publication?! fingers crossed!) however, I've got the ok to share some of the details of this beautiful space. to share more with us! in Shreveport, Louisiana. How about this kitchen!! 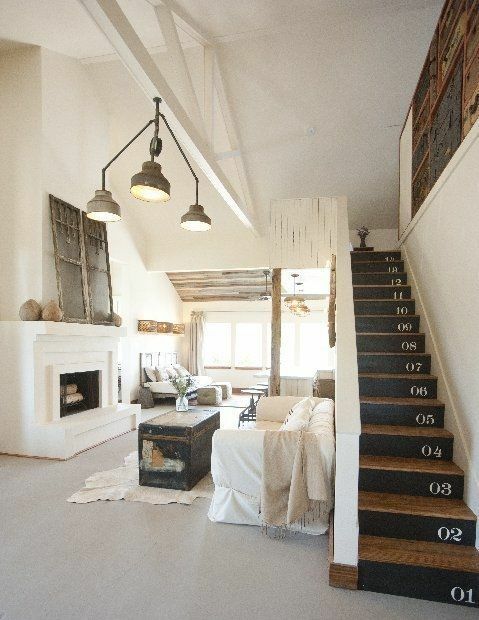 Just days before the Marburger Farm antiques show was scheduled to open, I received a call from Paige Hull, owner of The Vintage Round Top, a charming, hip rental cottage in Round Top, Texas. Paige and her husband, Smoot, were setting up at Marburger for the first time and asked if I could fill in last minute for their stylist who was unable to make it. After seeing her gorgeous home and some shots of the merchandise from France they would be selling at the show, I couldn't say "yes" fast enough. We had the best time pulling together all the details that Paige so lovingly chose. The space that Paige and Smoot envisioned and then created defies description, so I'll let you experience it through my lens. These small notebooks were gifts for bloggers and designers that visited The Vintage Round Top at Marburger Farm. If you missed them, I hope you'll have a chance to meet Paige and Smoot at the spring show or treat yourself to a relaxing and inspiring weekend at their adorable cottage in Round Top, Texas.